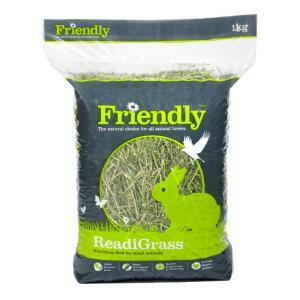 Friendly ReadiGrass is made in the heart of Yorkshire. It offers a delicious fibre source to keep your animal healthy. Our drying process removes only the water – keeping the natural flavour, wonderful smell, colour and high nutrient value of fresh grass. A great source of fibre which keeps the digestive system moving effectively. Balanced protein that delivers energy and supports healthy growth. Provides vitamins & minerals that required to maintain health and keep coat shiny. Helps promote dental health by grazing on grass it helps keep your pets teeth worn and healthy.